Well, turnabout is fair play and Phoebe was ready to rock and roll at 3 am. I laughed at the scene yesterday morning when I discovered Phoebe chattering away and sitting up playing while Mom slept slack-jawed in the bed next to her. I’m certain the day nurse witnessed the exact same scenario with myself and Phoebe this morning when she came on shift at 7:30 am. 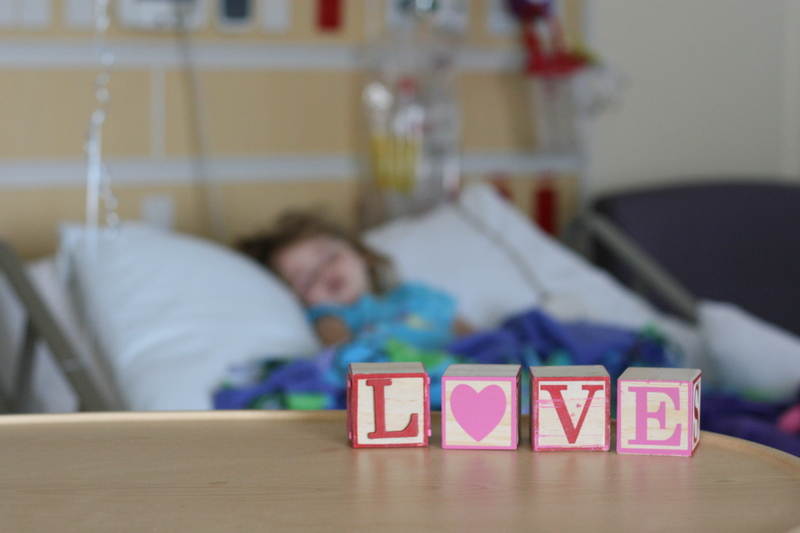 While the rest of the patients slumbered peacefully in the neighboring rooms, Phoebe and I were playing ball, making sticker pictures, talking incessantly about my hair and whether she wanted peaches or peanuts and then we had a Veggie Tales marathon as the sun peeked through the hospital windows. I kept eye-balling the clock and thinking “if she goes to sleep now, I can still get an hour and a half of sleep”…”if she goes to sleep now, I can still get 45 minutes of sleep”, and so on until the minutes evaporated with the morning dew and it was time to start the day. She received 2 more chemotherapy treatments today and has tolerated the initial infusions well. The highlight of the day was watching her walk through the hall during Physical Therapy and put stickers on all of our noses. She kicked a big pink ball around for a while as I steadied her and got some good muscle strengthening excersize. In many ways she seems more like she was a year ago..her hair is fuzzy and her cheeks are rounder and she is more unstable on her legs. We have regressed in regards to many of her accomplishments, including potty training, but all of those things will come back in time with practice and as she feels stronger. I am thankful that her motor skills are still intact and her congnitive abilities remain the same as they were before brain surgery. I had no idea how fortunate we were that she came through her surgery so well until I read the stories of several other brain tumor resection patients and realized that many of them have long term residual effects in these areas. Phoebe had a complete resection, meaning that the neurosurgeon was able to remove the whole tumor, no tumors were detected on her spine and no cancer cells were found in her cerebro-spinal fluid 3 weeks post surgery. I am writing these things out today as a praise and a reminder to myself that we are starting this journey with the best possible odds with AT/RT cancer. I also know that information is important for other AT/RT families reading this journal. More praise: Phoebe’s sores on her bottom look great right now. We have been told they might start to deteriorate again as this chemo pushes her blood counts down, but we are praying that we will not see that happen. Her sodiums have been in the mid to low 140’s for the past 2 days! So, she got on top of all of her issues just in time to start round 2. I am thankful that she is starting out in a better place than I expected a few days ago and I am allowing myself to feel a little glimmer of hope that we might get to take her home after this round for a few days. Tonight Nathan’s Mom is coming to stay with Phoebe and Nathan and I will be at home with the boys. Their Great-Grandparents took them to the Dallas Aquarium yesterday and they had a wonderful time. Seeing more of our families and becoming more united in crisis has been one of the unexpected blessings of Phoebe’s journey. We are so grateful for the many ways that they have come alongside of us in the past weeks. As for turning the journal into a book, I would love that. We are currently working on a blog where we can post the Caring Bridge posts all the way from the beginning along with the pictures that match the post. Caring Bridge does not acomodate larger pics and many of the recent ones taken with the better camera are larger. We will let you know when it is up and running. Tonight, please pray for Phoebe’s heart rate, it is up in the 190’s in response to her chemo and her oxygen has dipped a couple of times into the 80″s. Her heart rate should be around 120. Also, pray that her grandmother will surivive the 3am “Party til the break of dawn” Phoebe fun-time! Thank you all for praying and posting!